If I were to sum up the second demonstration & practical class in one word, it would be “chaotic”. It is worth noting that in the said chaos, I have misplaced my pastry brush (someone borrowed it and now it’s walked off), and my magnets that we use to hold down parchment paper. Really unimpressed with self, and the overall turnout of the second class. 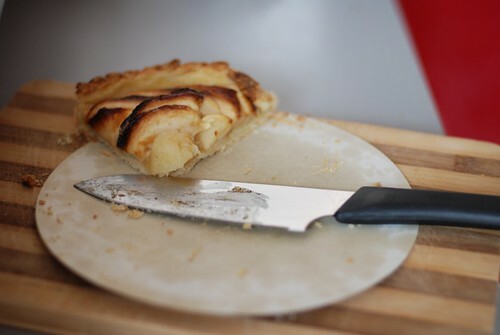 The class was focused on pâte brisée sucrée, which is sweet short crust pastry. Normally I make a mean pie pastry (see examples here and here), but I had never tried it with an egg. 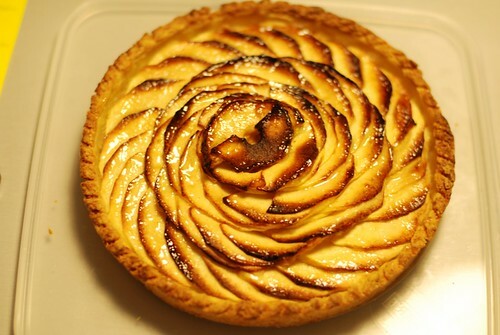 During the practical, the chef demonstrated 3 different apple tarts using the same pastry, and I don’t know what exactly it was about the chef or the recipes, but the whole demonstration felt rushed and disorganized. I was flipping back and forth between recipes to jot down notes for different things, and although the chef did a great job demonstrating, he didn’t necessarily narrate his actions as well as some of the other chefs. He showed us how to mold the tart pastry (using just a ring, no bottoms!) twice, which was super helpful, but otherwise I felt overwhelmed with sentences, not tips for success. I think most people felt confused and disorganized after the demonstration, because there were quite a few people discussing notes and asking clarifying questions afterwards. I had a long break before the practical class that same night, and I must admit, even though I filled my recipe with instructions, the words didn’t add to my confidence walking into the kitchen later that night. We had the younger, more strict chef for our practical class. My heart sank a bit because I knew he expected order and confidence, and I really had neither to offer. This made me nervous from the beginning, and I just didn’t feel good about my task, which wasn’t a good sign. The workstation all of a sudden felt overcrowded. I weighed out my ingredients and began working. The dough was forming fine until I began over-thinking it – was I kneading too much? Flouring the surface too much? It began cracking and I felt sweat beads form as I hastily patted and patched…while looking nervously for the chef to see if he had helpful comments or stern looks to give. When he finally came by, I had rolled out the dough enough, and he told me that I didn’t flour enough. He scraped off dough from my rolling pin and marble surface to prove his point. Sigh…totally ironic. Next came the peeling of apples. Since we can’t look amateurish while peeling, I was having a really hard time using the peeler “correctly”. I have stained my chef jacket, my apron, and my tea towel with apple juice from the peeling kerfuffle…that’s how hard it was for me to peel 5 apples. I started cooking my apple filling shortly after, but not before I looked around at my classmates and got even more flustered because they were all doing different things! Note to self: stop looking at other people. The chef is there to help you. Everyone else may just confuse you. Another step that I had anticipated would be difficult, but was easy, was arranging the apples on top. Again, the demonstration chef took great care to show and explain to us, but this part came quite naturally to me and I was done within minutes. It makes me a little annoyed because really, the lesson was about the pastry, and the lack of focus on the important details like rolling out the pastry, feeling it for the right consistency, made the practical that much more stressful for me. Meanwhile, things like crimping and arranging apples were so minor, and really not too hard, yet somehow they were exaggerated into focal points. It was all very messy. 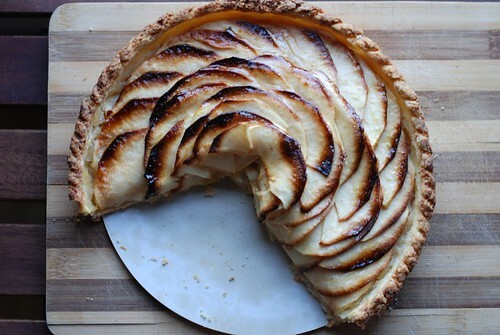 I’m pleased to say my tarte aux pommes turned out well, and I loved the design on top. The chef singled me out though, to ask why I didn’t share a baking sheet. I had to admit sheepishly that I couldn’t move my crust at all, so I couldn’t make room for anyone else. It was quite embarrassing. We got some feedback from the chef at the end, and I lucked out with feedback from two chefs, because a cuisine chef happened to stop by at that moment. Both chefs looked happy with my work, and my chef told me it was very good for a first try. Unfortunately, I have developed a severe case of paranoia, so I think he was just telling me that to shut me up. I think he dislikes me. It’s all a conspiracy. He’s just so good at making me feel mortified about not being able to zest oranges or crimp pastry that I am certain he doesn’t like me. I’ve gone to the dark side of paranoia, I know. 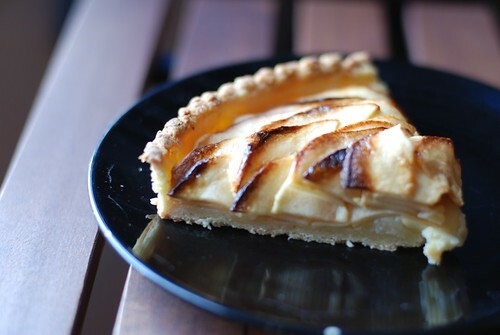 The tart tastes great. I love the pastry for it, and will definitely be practicing and applying it to other recipes from now on. It’s not as buttery-tasting as my fail-proof recipe, and has a bit more character than just butter and flour, which is nice. I just need to get it down pat so I can make it confidently, without all that cracking and sticking! This was all that was left 12 hours after I brought it home. Alex is going to be very large soon. Thanks! Don’t forget to update your blog with your favourites around Paris so I can check ’em out! :) Bon voyage!